Source: House Committee on Science, Space, and Technology. 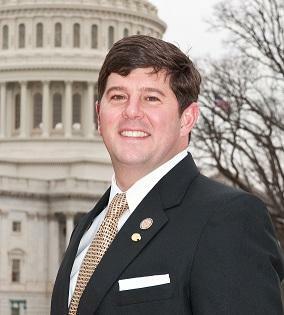 Congressman Steven M. Palazzo (Souce: US Government). Good morning and welcome to today’s hearing on the President’s 2013 budget request for the FAA Office of Commercial Space Transportation. I want to thank our witnesses, Dr. George Nield and Cpt. Wilbur Trafton, for joining us. I know that many people put in a lot of effort preparing for these hearings, and we appreciate you taking time from your busy schedules to appear before the Subcommittee. I also want to assure you that we greatly value your expertise and wisdom, and your testimony will benefit this committee in the weeks and months ahead as we endeavor to better improve the policies that will guide our nation’s evolving commercial space program. The Office of Commercial Space Transportation, known as AST, has successfully licensed over 200 launches since 1984 without loss of life, serious injury or property damage to the general public, which is a notable record in this inherently risky business. AST’s mission is to ensure the protection of the public, property, and the national security and foreign policy interests of the United States during commercial launch or reentry activities. Currently AST has 14 active launch licenses and 8 spaceport licenses, and is working with SpaceX and Orbital Sciences for the upcoming NASA COTS and Commercial Resupply Services missions. Additionally, AST is coordinating with NASA for licensing the Suborbital Flight Opportunities Program as well as working toward the day when commercial crew demonstration flights will begin. The AST budget proposal for Fiscal Year 2013 includes a 2% increase, which is intended to allow AST to double the number of staff in field offices in anticipation of potentially up to 40 launch and reentry operations in 2013. This significant increase reflects several launches for ISS cargo resupply, and long- anticipated flights in the suborbital tourism market. The recently passed FAA reauthorization bill includes an extension of the regulatory moratorium on commercial human spaceflight systems to October 2015. It is my hope that FAA will use this time to engage with industry stakeholders on its regulatory approach and licensing standards to prepare the path forward for a proposed rulemaking. It is also critical that a delineation of roles and responsibilities among FAA’s various offices be clearly articulated to ensure that industry won’t be hindered by duplicative or ambiguous requirements. With these developments in mind, I do have some concerns with NASA’s use of Space Act Agreements inasmuch as they cannot impose safety requirements on program participants. And considering that FAA will not be able to promulgate human spaceflight regulations for severalyears, I realize that AST has a significant amount of work ahead as it endeavors to align its regulatory approach with evolving industry approaches to safety, all the while having to comply with the moratorium. We will be closely monitoring the collaboration between FAA and NASA in this area to ensure these agencies avoid conflicting or duplicative responsibilities while balancing authority for commercial space operations on NASA missions. I am pleased to note that AST is working closely with range partners at the Wallops Flight Facility, the US Air Force at the Eastern and Western Ranges, and NASA offices at Johnson Space Center and Kennedy. These relationships help accomplish our national objectives to further NASA priorities with commercial space industry support. AST also carries the dual mission to “encourage, facilitate and promote” the U.S. commercial space transportation industry. While I trust that safety is the highest priority for this agency, I would like to better understand how AST balances this dual mission. This is especially important when evaluating the responsibility that AST shares with the Aviation Safety branch of the FAA on newly developed hybrid vehicles that will share the National Airspace System with transport and general aviation aircraft. The AST budget also proposes funding for the Center of Excellence for Commercial Space Transportation. Described as a cost sharing partnership of academia, industry and government entities focusing on research of primary interest to AST and US commercial space industry, the Center of Excellence is a consortium of 8 universities. While it has been funded for the past two years from the FAA’s RE&D account, AST now plans to include this 1 million dollar operation to its base budget. I am happy to see this office engage with the best and brightest minds in our universities, and I look forward to learning more about research projects, outcomes and contributions the consortium is achieving to help advance the role of commercial space. As I close, I’d like to commend Dr. Nield on AST’s impressive safety record. While I understand that their core business operations focus on maintaining this record, there are numerous challenges ahead as the industry anticipates a period of high growth. Keeping in mind interagency coordination, budgets, the vagaries of the marketplace, and an eager emergent industry, the upcoming years are sure to offer exciting innovations as we work to maintain US leadership in space. I now recognize ranking member Jerry Costello, for his opening statement.